Check out this super-fun drawing by Firestorm vol III artist Jamal Igle! This is the Satellite Era Justice League kicking back and enjoying some time off! Going around the table from left to right you’ve got: Barry Allen (Flash), Ronnie Raymond (one half of Firestorm), Professor Martin Stein (the other half of Firestorm), Ray Palmer (The Atom), and Hal Jordan (Green Lantern)! Click the image to enlarge! Notice Hal distracting the hormonally-driven Ronnie with a Black Canary construct, meanwhile he’s checking out Ronnie’s cards with a camera construct! Hal, you cheater! My thanks to Eric Sellers for the heads-up on this commission! Keep up with Jamal Igle on his website and Twitter! Support Firestorm (and Jamal Igle)! Fan the Flame! Posted in: Firestorm #01: Original (Ronnie/Martin), Jamal Igle, Justice League of America, Professor Martin Stein, Ronnie Raymond, Sketch/Art. Shouldn’t Katar be the chef? He once kicked Shayera out of the kitchen, claiming that on Thanagar that was a man’s task. 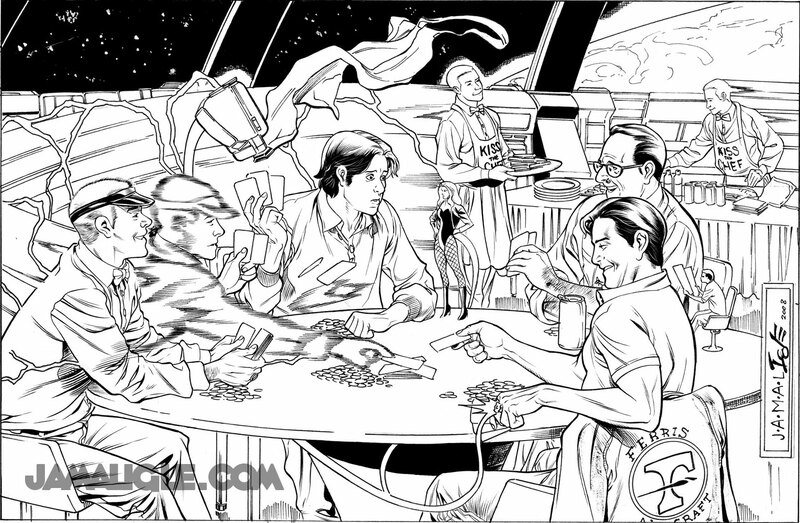 I imagine the other JLAers didn’t invite Katar and Ollie because they wanted to have fun at poker night.